Decluttering is all the rage these days and while I'm not ready to purge 75 percent of my belongings, I see the sense in simplifying. I'm all about layering skincare products but for most mornings I'd rather sleep in and have time eating breakfast rather than slathering on several serums. 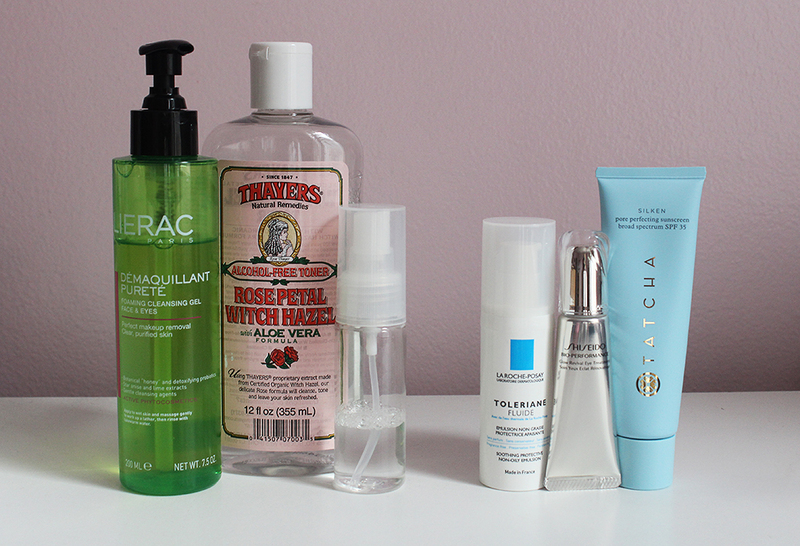 This is my current five step morning skincare routine which I'm pretty satisfied with. I start by cleansing my face with the Lierac Purifying Cleansing Gel* to wash off skincare residue from the night before as well as any oil and dirt. This gel cleanser foams up into a light froth and is ideal for oily combination skin. It cleanses well and doesn't make my skin feel dry. One thing that could be improved is that the fragrance is too strong. I'd rather this have no scent. I've gone back to Thayer's Rose Petal Witch Hazel as my toner because it's gentle, refreshing and inexpensive. I decant it into a small Muji spray bottle so it's easy to travel with as well. I've been through at least three bottles of Thayer's Witch Hazel and think I'm going to stick to it for awhile. I declared the La Roche Posay Toleriane Moisturizers as my HGs back in 2012 but I took a break from them for the past three years. Since then I've used countless moisturizers that didn't come close in terms of fuss-free results. I decided enough was enough and added the Toleriane Fluid back into my routine. 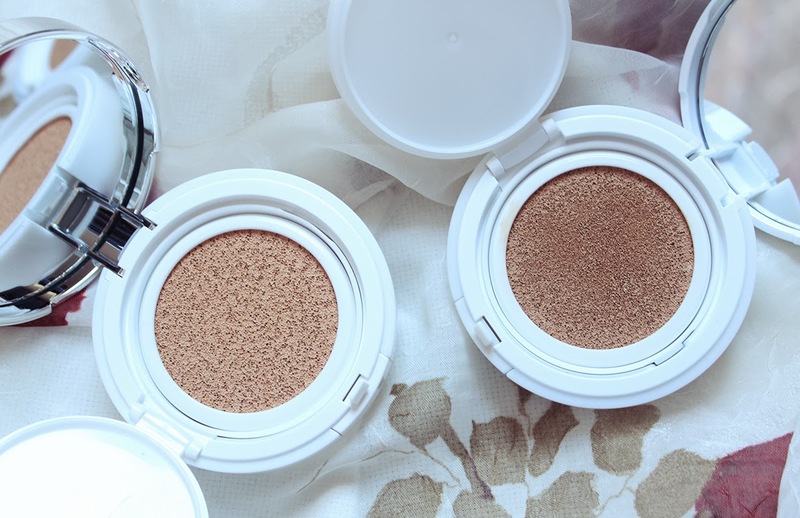 It's ultra lightweight and comfortable on the skin while still providing enough moisture. Since I don't use a rich cream all over my face in the morning, I like to use an eye cream under my eyes so that my concealer goes on smoothly. The Shiseido Bio Performance Glow Revival Eye Treatment* has been my daytime eye cream of choice because it contains very fine micro shimmer that reflects light and makes the skin around my eyes slightly brighter. 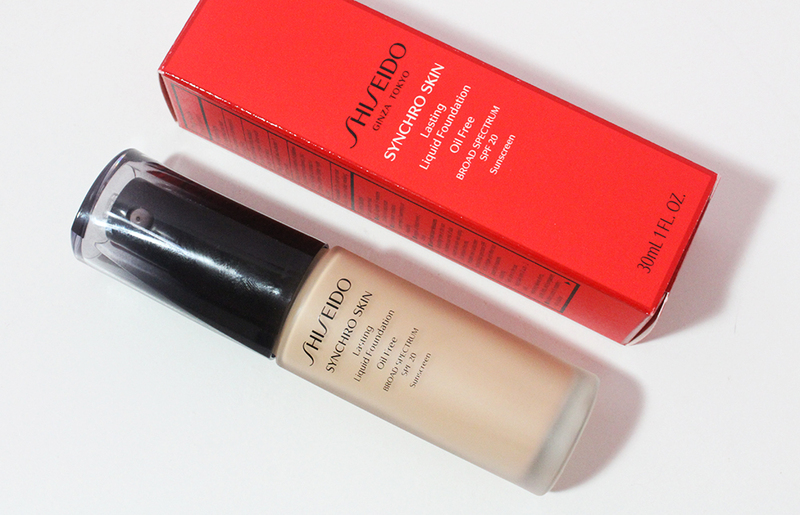 The formula is moisturizing enough to provide a base for my concealer but it's not greasy or slippery at all. The applicator is a unique plastic tip that I use to massage and de-puff my under eye area. The last step of my morning routine is one of the most important, sunscreen. I've been using the Tatcha Silken Pore Perfecting Sunscreen SPF 35* which has been a firm favorite for many bloggers. 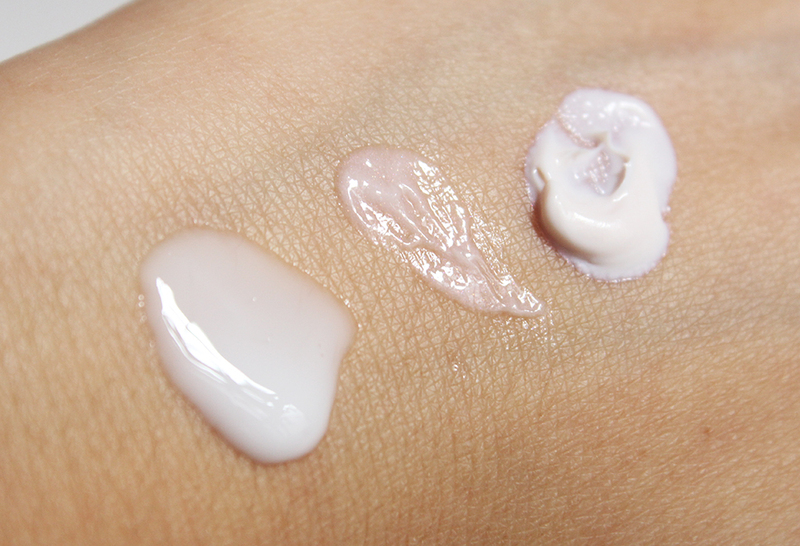 The cream has a slightly pink tone and a trace of ultra fine shimmer which brightens the skin without making me look ghostly. The sunscreen seems to form a light protective layer on the skin and I feel why it claims to be a good makeup base. This sunscreen claims to be weightless and I've read reviews that agree but I can still feel something on my skin after I put this on. Luckily, it doesn't make me greasy and wears nicely throughout the day on my skin. I can't say that this sunscreen has permanently reduced the size of my pores but they do look less noticeable while I'm wearing this. This regimen will likely take me through the winter and spring. I'll have to swap in the regular La Roche Posay Toleriane Moisturizer instead of the fluid when the air gets colder and drier though. What does your morning skincare routine consist of? *Products marked with an asterisk were provided by PR for consideration. All opinions are 100% honest.